To better play the role of national academies of sciences in achieving the Sustainable Development Goals (SDGs) set by the United Nations with a focus on poverty alleviation, a session of IAP-SPEC conference convened in Beijing on December the 9th and the 10th, 2017. To end poverty, protect the planet and ensure that all people enjoy peace and prosperity, a collection of 17 SDGs was adopted at the UN General Assembly in 2015. Specificially focusing on the SDG1 (no poverty) and SDG10 (reduced inquality), the theme of the IAP-SPEC meeting was "Science-Based Solutions for Poverty Eradication and Sustainable Development: Science Academies Working together to Tackle SDGs". Mainly explored at the conference were possible solutions to poverty eradication via science, and the role of science in reducing inequality within and between countries. Also, representatives from a number of national academies of sciences as well as international organizations discussed the responsibilities and missions of the scientific community in poverty eradication. Sponsored by the Chinese Academy of Sciences (CAS) and the InterAcademy Partnership (IAP), the conference was organized by the Institutes of Science and Development, CAS (CASISD). 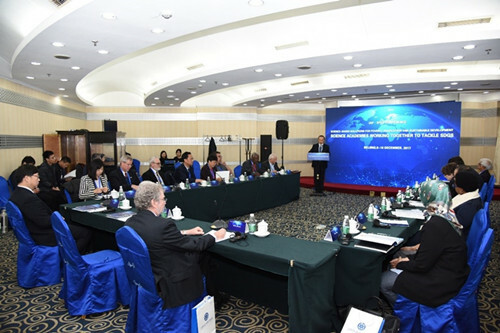 CASISD Vice President Wang Yi presided over the meeting. CAS Vice President Zhang Tao and President of Brazilian Academy of Sciences Luiz Davidovich gave speeches at the opening ceremony. In his speech, Prof. Zhang introduced the progress of China's poverty alleviation and the efforts made by CAS in targeted poverty alleviation and technology poverty alleviation. He pointed out that poverty eradication is a long-term cause, and the scientific community is duty-bound to work for this goal. Particularly, he appreciated the success of the first IAP-SPEC conference held in Brazil in 2014, praising its great contributions to poverty alleviation. He expressed his hope that the Beijing conference could make good use of the resources of IAP member academies, so as to better serve the poor. Prof. Luiz Davidovich introduced the progress and achievements made by the national poverty alleviation committee of Brazil, emphasizing that what a science community serves is not only its own country, but also the whole humankind. Eliminating poverty is not only a scientific issue, but also a moral one, he stressed. Poverty, he said, is a global challenge that requires joint efforts of interdisciplinary research. Tackling this challenge, he continued, calls for the participation of a variety of professionals, ranging from sociologists, economists, geographers, physicists, to geophysicists, biologists and medical scientists. Prof. Wang Yi gave a speech on the concepts of sustainable development and ecological civilization in the context of China; also he elaborated on the path, objectives, actions, future challenges and presented priority areas of sustainable development as well as ecological civilization in the country. Some Chinese experts and scholars gave a comprehensive account of China’s policies, experience, achievements and challenges of poverty alleviation respectively from the perspectives of social poverty alleviation, technology poverty alleviation, precision poverty alleviation and China's sustainable development policy. Participants from different countries discussed the role of science in poverty eradication, and explored what contributions the scientific community could make to the cause in terms of climate change, food safety, public policy and women's rights and interests. At the meeting, members of the IAP Scientific Committee on poverty reduction talked about its future activities and defined major topics to be coped with. Based on the discussion, they arrived at an initial agreement on a recommendation to hold a conference on poverty reduction in 2018 under the framework of IAP, and to produce related documents. Present at the meeting were more than 20 distinguished experts in related fields, including Prof. Aishan Bidina, Faculty of Law, National University of Malaysia; Prof. Lai-Meng Looi, Department of Pathology, University of Malaya; Prof. Lisa Reise, Institute of Philosophy and Social Sciences, University of Fed Rio De Janeiro, Brazil; Prof. Fernando, Filgueira, Center for Information and Studies of Uruguay; Prof. Julian May, Director of NRF-DST Centre of Excellence in Food Safety, University of the West Cape, South Africa; Prof. Ratemo Michieka, Honorary Secretary of Department of Crop Science, University of Nairobi, Kenya; Prof. Yousuf Maudarbocus, Vice President for Policy Review and Administration, Network of African Science Academies (NASAC); Prof. Judith Teichman, Department of Political Science, University of Toronto, Canada; Prof. Naoya Abe, Department of Transdisciplinary Science and Engineering School of Environment and Society, Tokyo Institute of Technology, Japan; Prof. Peter Fritz, Director of Helmholtz Centre of Environmental Research, Germany; Prof. Liu Yansui, Director of the Research Centre for Regional Agriculture and Rural Development (RARD), CAS; and Prof. Liu Jinlong, Department Chair of the School of Agricultural Economics and Rural Development and Director of the Centre for Forest, Environmental and Resources Policy, Renmin University of China.